If you want to see an example of 1950s British “kitchen sink” drama at its very best, keep on the lookout for returns to the sold-out Donmar Warehouse production of Roots. Last minute returns were the only way I was able to see this 1959 masterpiece by Arnold Wesker and I am still tingling from the thrill of seeing a great play acted and directed with such meticulous attention to detail and theme. British theatre critics may use John Osborne’s play Look Back in Anger from 1956 to mark the turning point in British drama from the drawing room comedies of Noel Coward and stiff upper lip dramas of Terence Rattigan toward the more naturalistic, overtly political plays that followed, but Anger is a play that has not survived well. Jimmy Porter, the epitome of the “the angry young man”, does little but rail against the class system with a good admixture of misogyny and xenophobia while verbally abusing all those around him who, incomprehensibly, find something noble about his rage. Roots is a much stronger play because Wesker has mediated the anger of someone like Jimmy Porter through the viewpoint of another person and because he has told a dramatic tale of the wandering youth returned home that has greater resonance beyond its specific place and time. In Roots, Beatrice Bryant, known as Beatie (Jessica Raine) returns home from working in London to her family in a small Norfolk village. Her goal is to prepare them to meet her fiancé Ronnie, who is expected to travel up north to meet her. The play is structured in three acts. In the first Beatie visits her sister Jenny (Lisa Ellis) and brother-in-law Jimmy (Michael Jibson). In the second she visits her mother (Linda Bassett) and father (Ian Gelder). In the third the whole family, including her brother Frank (Carl Prekopp) and his wife Pearl (Emma Stansfield), gather at her parent’s house to await Ronnie’s arrival. While Beatie simply feels she is returning home, Wesker beautifully details the enormous extent Beatie’s time away has changed her. The changes that Beatie is most aware of have to do with Ronnie’s socialist philosophy and views on art that Beatie has absorbed and attempts to promulgate among her family. The melancholy irony of the play is that Beatie is not fully aware that she has changed in far more substantial ways that separate her almost completely from those she loves. While Beatie feels her mind has been opened by Ronnie’s political radicalism and insistence that the status quo must change, Wesker makes painfully clear to us that Jenny’s optimism stems just as much from having escaped her origins since the status quo of those who have stayed has stagnated or declined. Stan Mann (David Burke), an old eccentric and the liveliest character in the village, dies halfway through the play. Both Beatie’s father and Jimmy suffer from serious diseases that they refuse to acknowledge because to do so could mean the end of their work. Jenny and Jimmy live in a cottage without electricity and Beatie’s father is extraordinarily stingy with the electricity he has. No one ever says so but Wesker makes clear that Beatie’s mother’s life is measured by the timings of the buses and delivery trucks she hears in the distance. Though the play is literally a kitchen sink drama, with a working sink featured in both Acts 1 and 2, director James Macdonald shows that the play is more than a naturalistic slice of rural life and subtly brings out the universal aspects of the story. Hildegard Bechtler’s sets feature the minimum of naturalistic furniture necessary for each act, but the rooms have no walls or doors and occasionally Guy Hare’s lighting will illuminate a photo of the Norfolk wastelands that lies in darkness through most of the action. The production is graced with uniformly exquisite performances. 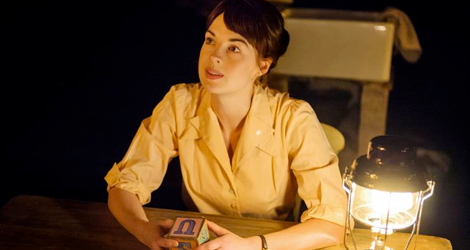 Jessica Raine, familiar to most people from her role as Jenny Lee on the television series Call the Midwife, is luminous as Beatie. She gives Beatie a wonderful mix of intelligence and naïveté – intelligent because she understands most of the new ideas that Ronnie has explained to her, naive because she can’t see that her family will not be as enthusiastic for these ideas as she is. She is also naive because she forgets that she was once as resistant to Ronnie’s ideas as her family is now. In the play’s gloomy landscape Raine’s Beatie bubbles with life, unaware of how all those around her have had the life beaten out of them. 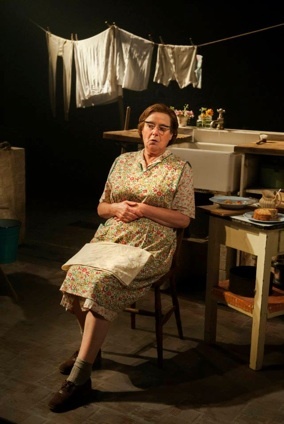 Beatie’s prime opponent is her mother in a magnificent performance by Linda Bassett. For most of the play Bassett makes the mother come off as a comic figure, both naturally and willfully ignorant and proud of it. She listens to Beatie ramble on about Ronnie’s ideas as if Beatie were a baby babbling, but at the same time Bassett shows there is a steely side to this woman who is not foolish at all but is totting up all the inconsistencies in Beatie’s words and behaviour ready to use them as a weapon against her own daughter. In word and gesture Lisa Ellis as Jenny, Michael Jibson as Jimmy and Ian Gelder as Beatie’s father all show they have been defeated by life. It is painful to see Gelder plead with his young boss (Nic Jackman) to keep him on since we know both know the job is now beyond him. Jibson’s Jimmy is clearly just a younger version of Beatie’s father with only the unchangeability of everyday life as comfort. Ellis’s Jenny is the most sympathetic to Beatie but she is more happy that her sister is in love rather than that Beatie has any life-altering views. Beatie cleans up Jenny’s cluttered house like a whirlwind, but Jenny knows it will just be back to its usual mess in minutes. Beatie’s brother Frank and his wife Pearl have moved away from the abject poverty of Beatie’s parents and Jenny, but Carl Prekopp and Emma Stansfield show that this rise in status has just given them greater emotional distance from Beatie. Stansfield, however, seems to suggest that she would show more interest in Beatie’s ideas if Frank weren’t present. As Stan Mann, David Burke represents a symbol of the little bit of vitality of Norfolk life. He has a licentious sense of humour but drinks huge amounts to dull the inner and outer pains of living. Wesker’s Roots moves beyond the usual themes of naturalistic plays by also focussing on the importance of language. The key component of the dullness of Norfolk life is the unwillingness, bordering in inability, of the inhabitants to put any of their thoughts or feelings into words. For Beatie’s mother in particular words serve only a functional purpose not an expressive one. While Beatie’s constant quoting of Ronnie’s various dicta may show her as merely a recent acolyte of his thoughts, it also shows, more importantly, that her life with Ronnie has opened her eyes to the world of language in general. The main theme Wesker charts is how Beatie comes to find her own voice – and it’s a voice highly critical of the complacency around her. Wesker’s view of popular entertainment’s role as a diversion from political action is, chillingly, even more relevant now that when he wrote it in 1959. After the National Theatre’s great success with Wesker’s spectacular play The Kitchen (1961) in 2011 and now the Donmar’s with this exquisite rendering of Roots, let’s hope that a revival of interest in Wesker is on the way – and not just on the eastern side of the Atlantic. Photo: (from top) Jessica Raine as Beatie Bryant; Linda Bassett as Mrs. Bryant. ©2013 Stephen Cummiskey.